For over 10 years we have been assisting customers improve product quality, increase productivity, and reduce maintenance cost. We are doing it with products that are accurate, reliable, user friendly and offer the best performance for the price-products that provide more value then any others in the market. The new generation mixing technology can be used as the main mixer, pre mixer as a coater for molasses, oil , enzymes for pellets / extruded products. 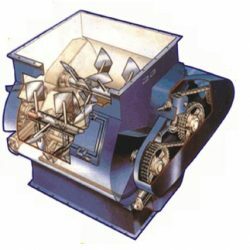 Our mixers’ provide a short mixing time to achieve a homogeneous mixing along with a unique facility for spraying liquid to acquire a uniform coating on powder and optional accessory Pin Mill System facility for breaking the agglomeration formation. The other prominent features are high degree of precision mixing upto 10 PPM, low energy cost per ton of mix, negligible maintenance, high production output with a small batch mixer, fast discharge of mixed material through two large Bombay Doors avoiding segregation of mixed material. Thus the Toshniwal Mixer is an absolute choice not only in the food industry but also for foundry chemicals, construction chemicals, refractory, animal / poultry / aqua feeds, etc.